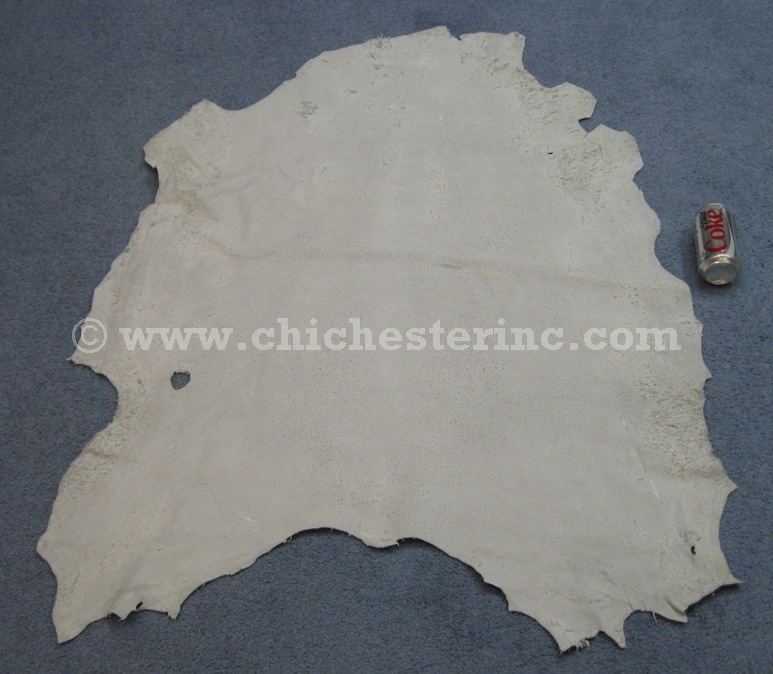 Our craft grade and tannery run sheep leather hides come in various sizes, generally falling within 5 to 15 sq. 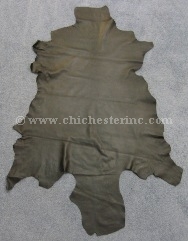 ft.
Tannery run grade leather is a mix of grades and is available in medium and heavy weights. They are not shaved to specific weights so the given weights are approximate. 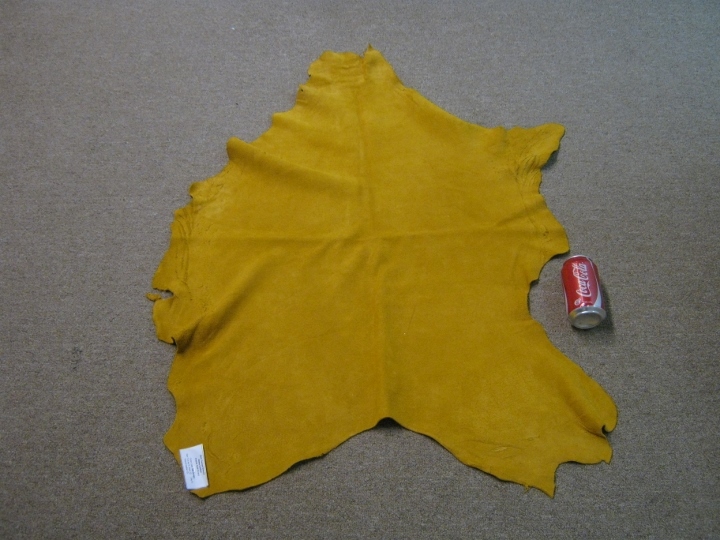 Also, this kind of leather did not undergo shaving or splitting, which means the leather was in its natural state when it went through the tanning process. The Tannery Run #1 grade hides are clean and are a good quality throughout. 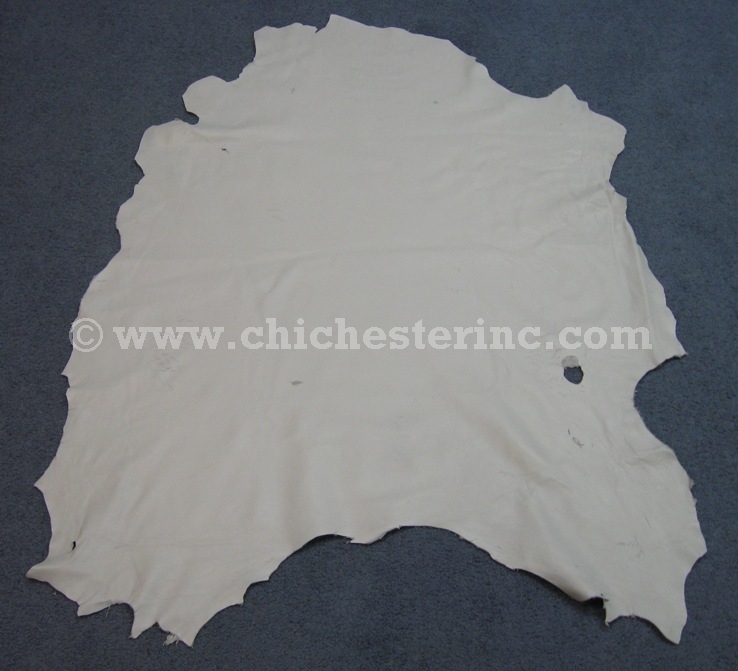 There are few holes or imperfections such as scratch marks that are mostly on the suede side and may have small patches and/or spots of uneven coloring. The Tannery Run #2 grade hides have extensive damage on the leather and suede sides (e.g. rubs, scratches, etc.). They may have a few holes and patches and/or spots of uneven coloring. The Craft grade leather will have some holes and flaws. We also carry good quality Shaved sheep leather in prairie gold. 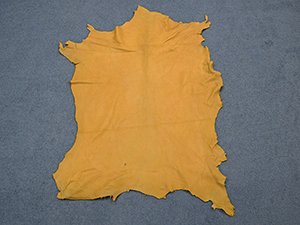 The leather hides range from 5 to 10.5 sq. 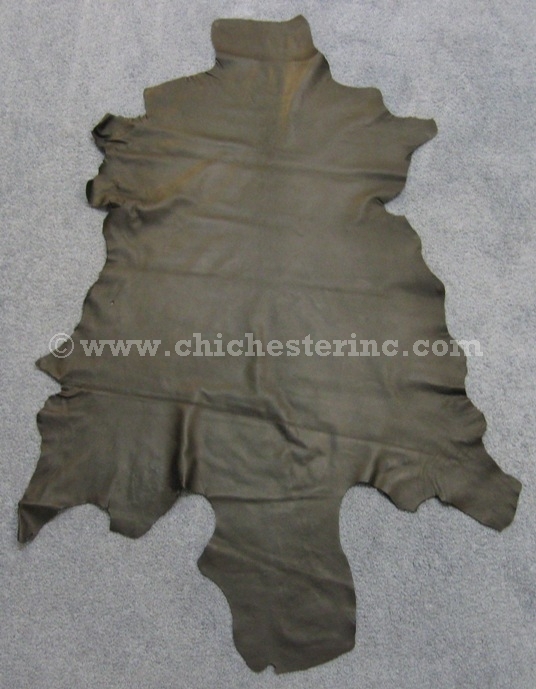 ft. Shaved leather have a more uniform thickness than tannery run leather and fewer to no holes. 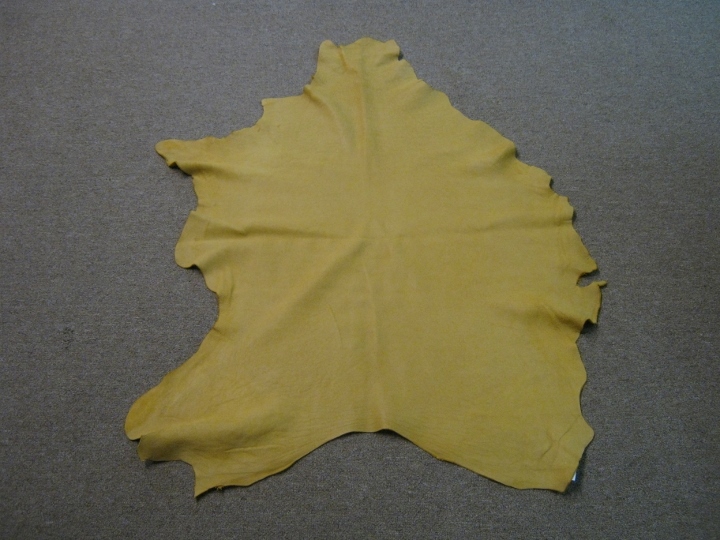 Deer Tanned leather is leather that has been tanned to resemble the soft, buttery and stretchy state of deer leather. 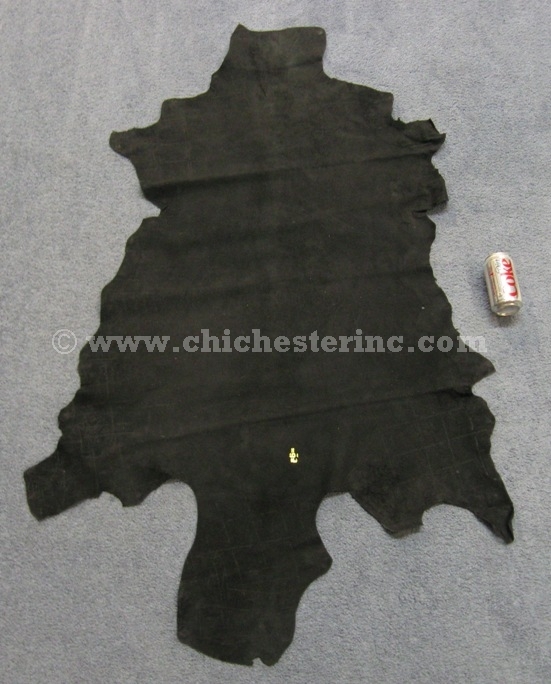 Sheep leather has two layers to it and is much easier to sew than deerskin or most other leathers as the needle goes through the hide much easier. Order Code Description Country Price per Sq. Ft.
Sheep are not an endangered species. The leather is a by-product of the food industry. 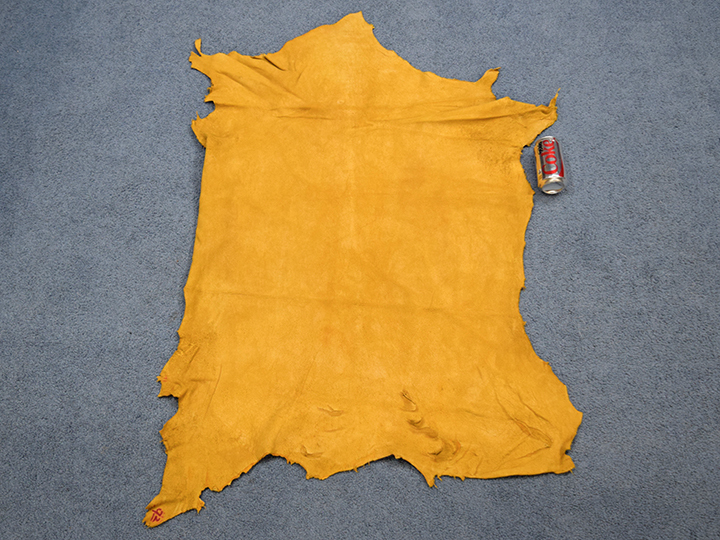 This hide pictured at right is approximately 9.75 sq. ft. and measures 58" long by 28.5" wide. It weighs 0.72 lbs. This hide is approximately 10 sq. ft. and measures 40" long by 37" wide. Thickness: ~4.5 - 5 oz. This hide pictured at right is approximately 9.5 sq. ft. It measures 46.5" long by 32" at its widest point. This 7.25 sq. ft. hide measured 38.5" long, 29" wide at the top, 28" wide in the middle, and 30" cm wide at the bottom. It weighs 0.95 lbs. This hide pictured at right is approximately 10.7 sq. ft. and measures 41" long by 35" wide down the middle.